When it comes to studying some of the most distant and oldest galaxies in the Universe, a number of challenges present themselves. In addition to being billions of light years away, these galaxies are often too faint to see clearly. Luckily, astronomers have come to rely on a technique known as Gravitational Lensing, where the gravitational force of a large object (like a galactic cluster) is used to enhance the light of these fainter galaxies. Using this technique, an international team of astronomers recently discovered a distant and quiet galaxy that would have otherwise gone unnoticed. Led by researchers from the University of Hawaii at Manoa, the team used the Hubble Space Telescope to conduct the most extreme case of gravitational lensing to date, which allowed them to observe the faint galaxy known as eMACSJ1341-QG-1. The study that describes their findings recently appeared in The Astrophysical Journal Letters under the title “Thirty-fold: Extreme Gravitational Lensing of a Quiescent Galaxy at z = 1.6″. Led by Harald Ebeling, an astronomer from the University of Hawaii at Manoa, the team included members from the Niels Bohr Institute, the Centre Nationale de Recherche Scientifique (CNRS), the Space Telescope Science Institute, and the European Southern Observatory (ESO). For the sake of their study, the team relied on the massive galaxy cluster known as eMACSJ1341.9-2441 to magnify the light coming from eMACSJ1341-QG-1, a distant and fainter galaxy. In astronomical terms, this galaxy is an example of a “quiescent galaxy”, which are basically older galaxies that have largely depleted their supplies of dust and gas and therefore do not form new stars. The team began by taking images of the faint galaxy with the Hubble and then conducting follow-up spectroscopic observations using the ESO/X-Shooter spectrograph – which is part of the Very Large Telescope (VLT) at the Paranal Observatory in Chile. Based on their estimates, the team determined that they were able to amplify the background galaxy by a factor of 30 for the primary image, and a factor of six for the two remaining images. A spiral galaxy ablaze in the blue light of young stars from ongoing star formation (left) and an elliptical galaxy bathed in the red light of old stars (right). Credit: Sloan Digital Sky Survey, CC BY-NC. Although other extreme magnifications have been conducted before, this discovery has set a new record for the magnification of a rare quiescent background galaxy. These older galaxies are not only very difficult to detect because of their lower luminosity; the study of them can reveal some very interesting things about the formation and evolution of galaxies in our Universe. In a similar vein, recent studies have been conducted that suggest that the presence of a Supermassive Black Hole (SMBH) could be what is responsible for galaxies becoming quiescent. As the powerful jets these black holes create begin to drain the core of galaxies of their dust and gas, potential stars find themselves starved of the material they would need to undergo gravitational collapse. In the meantime, follow-up observations of eMACSJ1341-QG1 are being conducted using telescopes at the Paranal Observatory in Chile and the Maunakea Observatories in Hawaii. What these observations reveal is sure to tell us much about what will become of our own Milky Way Galaxy someday, when the last of the dust and gas is depleted and all its stars become red giants and long-lived red dwarfs. How about four supernovae for the price of one? Using the Hubble Space Telescope, Dr. Patrick Kelly of the University of California-Berkeley along with the GLASS (Grism Lens Amplified Survey from Space) and Hubble Frontier Fields teams, discovered a remote supernova lensed into four copies of itself by the powerful gravity of a foreground galaxy cluster. Dubbed SN Refsdal, the object was discovered in the rich galaxy cluster MACS J1149.6+2223 five billion light years from Earth in the constellation Leo. It’s the first multiply-lensed supernova every discovered and one of nature’s most exotic mirages. Gravitational lensing grew out of Einstein’s Theory of Relativity wherein he predicted massive objects would bend and warp the fabric of spacetime. The more massive the object, the more severe the bending. We can picture this by imagining a child standing on a trampoline, her weight pressing a dimple into the fabric. Replace the child with a 200-pound adult and the surface of the trampoline sags even more. Massive objects like the Sun and even the planets warp the fabric of space. Here a planet orbits the Sun but doesn’t fall in because of its sideways orbital motion. Similarly, the massive Sun creates a deep, but invisible dimple in the fabric of spacetime. The planets feel this ‘curvature of space’ and literally roll toward the Sun. Only their sideways motion or angular momentum keeps them from falling straight into the solar inferno. Curved space created by massive objects also bends light rays. Einstein predicted that light from a star passing near the Sun or other massive object would follow this invisible curved spacescape and be deflected from an otherwise straight path. In effect, the object acts as a lens, bending and refocusing the light from the distant source into either a brighter image or multiple and distorted images. Also known as the deflection of starlight, nowadays we call it gravitational lensing. Turns out there are lots of these gravitational lenses out there in the form of massive clusters of galaxies. They contain regular matter as well as vast quantities of the still-mysterious dark matter that makes up 96% of the material stuff in the universe. Rich galaxy clusters act like telescopes – their enormous mass and powerful gravity magnify and intensify the light of galaxies billions of light years beyond, making visible what would otherwise never be seen. Let’s return to SN Refsdal, named for Sjur Refsdal, a Norwegian astrophysicist who did early work in the field of gravitational lensing. A massive elliptical galaxy in the MACS J1149 cluster “lenses” the 9.4 billion light year distant supernova and its host spiral galaxy from background obscurity into the limelight. The elliptical’s powerful gravity’s having done a fine job of distorting spacetime to bring the supernova into view also distorts the shape of the host galaxy and splits the supernova into four separate, similarly bright images. To create such neat symmetry, SN Refsdal must be precisely aligned behind the galaxy’s center. The scenario here bears a striking resemblance to Einstein’s Cross, a gravitationally lensed quasar, where the light of a remote quasar has been broken into four images arranged about the foreground lensing galaxy. The quasar images flicker or change in brightness over time as they’re microlensed by the passage of individual stars within the galaxy. Each star acts as a smaller lens within the main lens. Detailed color images taken by the GLASS and Hubble Frontier Fields groups show the supernova’s host galaxy is also multiply-imaged by the galaxy cluster’s gravity. According to their recent paper, Kelly and team are still working to obtain spectra of the supernova to determine if it resulted from the uncontrolled burning and explosion of a white dwarf star (Type Ia) or the cataclysmic collapse and rebound of a supergiant star that ran out of fuel (Type II). The time light takes to travel to the Earth from each of the lensed images is different because each follows a slightly different path around the center of the lensing galaxy. Some paths are shorter, some longer. By timing the brightness variations between the individual images the team hopes to provide constraints not only on the distribution of bright matter vs. dark matter in the lensing galaxy and in the cluster but use that information to determine the expansion rate of the universe. You can squeeze a lot from a cosmic mirage! The Milky Way measures 100 to 120 thousand light-years across, a distance that defies imagination. But clusters of galaxies, which comprise hundreds to thousands of galaxies swarming under a collective gravitational pull, can span tens of millions of light-years. These massive clusters are a complex interplay between colliding galaxies and dark matter. They seem impossible to map precisely. But now an international team of astronomers using the NASA/ESA Hubble Space Telescope has done exactly this — precisely mapping a galaxy cluster, dubbed MCS J0416.1–2403, 4.5 billion light-years away. “Although we’ve known how to map the mass of a cluster using strong lensing for more than twenty years, it’s taken a long time to get telescopes that can make sufficiently deep and sharp observations, and for our models to become sophisticated enough for us to map, in such unprecedented detail, a system as complicated as MCS J0416.1–2403,” said coauthor Jean-Paul Kneib in a press release. Measuring the amount and distribution of mass within distant objects can be extremely difficult. Especially when three quarters of all matter in the Universe is dark matter, which cannot be seen directly as it does not emit or reflect any light. It interacts only by gravity. But luckily large clumps of matter warp and distort the fabric of space-time around them. Acting like lenses, they appear to magnify and bend light that travels past them from more distant objects. This effect, known as gravitational lensing, is only visible in rare cases and can only be spotted by the largest telescopes. Even galaxy clusters, despite their massive size, produce minimal gravitational effects on their surroundings. For the most part they cause weak lensing, making even more distant sources appear as only slightly more elliptical across the sky. However, when the alignment of the cluster and distant object is just right, the effects can be substantial. The background galaxies can be both brightened and transformed into rings and arcs of light, appearing several times in the same image. It is this effect, known as strong lensing, which helped astronomers map the mass distribution in MCS J0416.1–2403. Using Hubble’s Advanced Camera for Surveys, the astronomers identified 51 new multiply imaged galaxies around the cluster, quadrupling the number found in previous surveys. This effect has allowed Jauzac and her colleagues to calculate the distribution of visible and dark matter in the cluster and produce a highly constrained map of its mass. The total mass within the cluster is 160 trillion times the mass of the Sun, with an uncertainty of 0.5%. It’s the most precise map ever produced. But Jauzac and colleagues don’t plan on stopping here. An even more accurate picture of the galaxy cluster will have to include measurements from weak lensing as well. So the team will continue to study the cluster using ultra-deep Hubble imaging. They will also use ground-based observatories to measure any shifts in galaxies’ spectra and therefore note the velocities of the contents of the cluster. Combining all measurements will not only further enhance the detail, but also provide a 3D model of the galaxies within the cluster, shedding light on its history and evolution. This work has been accepted for publication in the Monthly Notices of the Royal Astronomy and is available online. Doing something extraordinary often requires teamwork for humans, and the same can be said for telescopes. Witness the success of the Herschel and Planck observatories, whose data was combined in such a way to spot four galaxy clusters 10 billion years away — an era when the universe was just getting started. Now that they have the technique down, astronomers believe they’ll be able to find about 2,000 other distant clusters that could show us more about how these collections of galaxies first came together. Although very far away, the huge clumps of gas and dust coming together into stars is still visible, allowing telescopes to see the process in action. “What we believe we are seeing in these distant clusters are giant elliptical galaxies in the process of being formed,” stated David Clements, a physicist at Imperial College London who led the research, referring to one of the two kinds of galaxies the universe has today. Elliptical galaxies are dominated by stars that are already formed, while spiral galaxies (like the Milky Way) include much more gas and dust. This finding is yet another example of how the data from telescopes lives on, and can be used, long after the telescope missions have finished. Both Planck and Herschel finished their operations last year. “The researchers used Planck data to find sources of far-infrared emission in areas covered by the Herschel satellite, then cross-referenced with Herschel data to look at these sources more closely,” the Royal Astronomical Society stated. The two telescopes had complementary views, with Planck looking at the entire sky while Herschel surveyed smaller sections in higher resolution. By combining the data, researchers found 16 sources in total. A dozen of them were already discovered single galaxies, but four were the newly discovered galaxy clusters. Fresh observations were then used to figure out the distance. You can read more details in the Monthly Notices of the Royal Astronomical Society or in preprint version on Arxiv. Put another checkmark beside the “cold dark matter” theory. New observations by Japan’s Subaru Telescope are helping astronomers get a grip on the density of dark matter, this mysterious substance that pervades the universe. We can’t see dark matter, which makes up an estimated 85 percent of the universe, but scientists can certainly measure its gravitational effects on galaxies, stars and other celestial residents. Particle physicists also are on the hunt for a “dark matter” particle — with some interesting results released a few weeks ago. The latest experiment with Subaru measured 50 clusters of galaxies and found that the density of dark matter is largest in the center of these clusters, and smallest on the outskirts. These measurements are a close match to what is predicted by cold dark matter theory, scientists said. Cold dark matter assumes that this material can’t be observed in any part of the electromagnetic spectrum, the band of light waves that ranges from high-energy X-rays to low-energy infrared heat. Also, the theory dictates that dark matter is made up of slow-moving particles that, because they collide with each other infrequently, are cold. So, the only way dark matter interacts with other particles is by gravity, scientists have said. To check this out, Subaru peered at “gravitational lensing” in the sky — areas where the light of background objects are bent around dense, massive objects in front. Galaxy clusters are a prime example of these super-dense areas. “The Subaru Telescope is a fantastic instrument for gravitational lensing measurements. It allows us to measure very precisely how the dark matter in galaxy clusters distorts light from distant galaxies and gauge tiny changes in the appearance of a huge number of faint galaxies,” stated Nobuhiro Okabe, an astronomer at Academia Sinica in Taiwan who led the study. Next, the team members could compare where the matter was most dense with that predicted by cold dark matter theory. To do that, they measured 50 of the most massive, known clusters of galaxies. Then, they measured the “concentration parameter”, or the cluster’s average density. 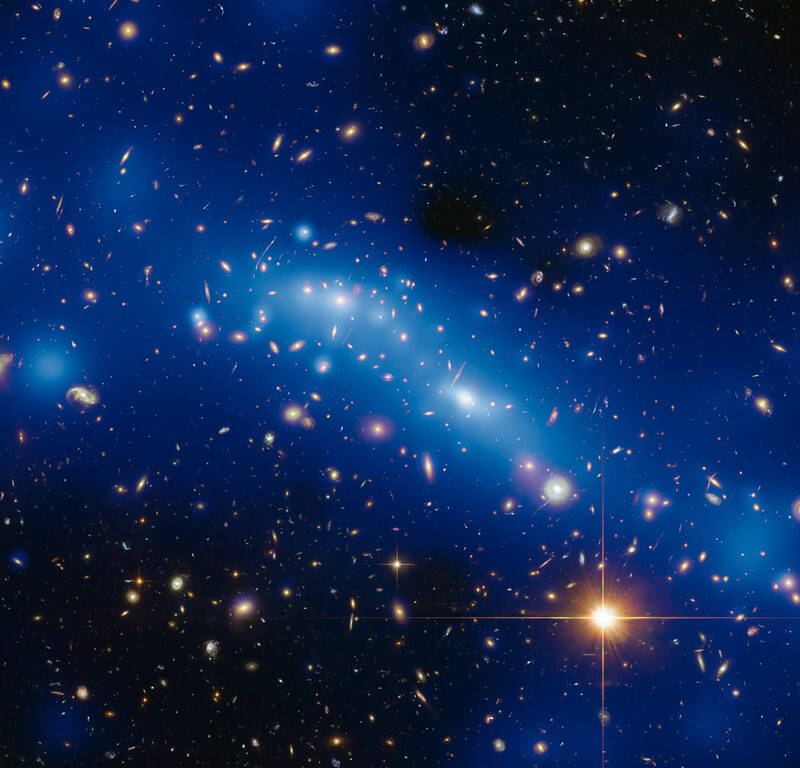 “They found that the density of dark matter increases from the edges to the center of the cluster, and that the concentration parameter of galaxy clusters in the near universe aligns with CDM theory,” stated the National Astronomical Observatory of Japan. The next step, researchers stated, is to measure dark matter density in the center of the galaxy clusters. This could reveal more about how this substance behaves. Check out more about this study in Astrophysical Journal Letters. Located at the southermost point on Earth, the 280-ton, 10-meter-wide South Pole Telescope has helped astronomers unravel the nature of dark energy and zero in on the actual mass of neutrinos — elusive subatomic particles that pervade the Universe and, until very recently, were thought to be entirely without measureable mass. The NSF-funded South Pole Telescope (SPT) is specifically designed to study the secrets of dark energy, the force that purportedly drives the incessant (and apparently still accelerating) expansion of the Universe. Its millimeter-wave observation abilities allow scientists to study the Cosmic Microwave Background (CMB) which pervades the night sky with the 14-billion-year-old echo of the Big Bang. Overlaid upon the imprint of the CMB are the silhouettes of distant galaxy clusters — some of the most massive structures to form within the Universe. By locating these clusters and mapping their movements with the SPT, researchers can see how dark energy — and neutrinos — interact with them. If neutrinos were particularly massive, they would have an effect on the large-scale galaxy clusters observed with the SPT. If they had no mass, there would be no effect. The SPT collaboration team’s results, however, fall somewhere in between. Even though only 100 of the 500 clusters identified so far have been surveyed, the team has been able to place a reasonably reliable preliminary upper limit on the mass of neutrinos — again, particles that had once been assumed to have no mass. Previous tests have also assigned a lower limit to the mass of neutrinos, thus narrowing the anticipated mass of the subatomic particles to between 0.05 – 0.28 eV (electron volts). Once the SPT survey is completed, the team expects to have an even more confident result of the particles’ masses. “With the full SPT data set we will be able to place extremely tight constraints on dark energy and possibly determine the mass of the neutrinos,” said Benson. “We should be very close to the level of accuracy needed to detect the neutrino masses,” he noted later in an email to Universe Today. Such precise measurements would not have been possible without the South Pole Telescope, which has the ability due to its unique location to observe a dark sky for very long periods of time. Antarctica also offers SPT a stable atmosphere, as well as very low levels of water vapor that might otherwise absorb faint millimeter-wavelength signals. The team’s findings were presented by Bradford Benson at the American Physical Society meeting in Atlanta on April 1. Read more on the NSF press release here. The mission began on 13th August 2009 with a goal to image the echo’s of the birth of the Universe, the cosmic background radiation. But scientists working on the European Space Agency’s (ESA) Planck mission got more than they bargained for making ground breaking discoveries and shedding light on old mysteries. By studying light from the far reaches of the Universe, Planck has to look through the rest of the Universe first and it was during this, that the incredible discoveries were made. The crazy thing about looking at the far reaches of the Universe is that we actually look back in time as it takes billions of years for the light to reach us here on Earth. This enables astronomers to look back in time and study the evolution of the Universe almost back to the Big Bang itself. Amongst the discoveries was evidence for an otherwise invisible population of galaxies that seem to be shrouded in dust billions of years in the past. Star formation rates in these galaxies seem to be happening at an incredible pace, some 10-1000 times higher than we see in our own Milky Way galaxy today. Joanna Dunkley, of Oxford University, said “Planck’s measurements of these distant galaxies are shedding new light on when and where ancient stars formed in the early universe”. One of the challenges of getting a clear view of these galaxies though has been removing the so called ‘anomalous microwave emission’ (AME) foreground haze. This annoying and poorly understood interference, which is thought to originate in our own Galaxy, has only just been pierced through with Planck’s instruments. But in doing so, clues to its nature have been unveiled. It seems that the AME is coming from dust grains in our Galaxy spinning several tens of billions of times per second, perhaps from collisions with incoming faster-moving atoms or from ultra-violet radiation. Planck was able to ‘remove’ the foreground microwave haze, leaving the distant galaxies in perfect view and the cosmic background radiation untouched. These results make Planck a roaring success but it doesn’t stop there. Other results just published include data on galaxy clusters revealing them silhouetted against the cosmic microwave background. These clusters contain thousands of individual galaxies gravitational bound together into gigantic strings and loops. The Planck mission, which was in development for 15 years is already providing some ground breaking science in its first few years of operation and its exciting to wonder what we will see from it in the years that lie ahead.